Democratic presidential candidate Marianne Williamson spoke to about 50 students and community members at the Top of the Hop Wednesday evening. On Feb. 13, Geisel School of Medicine chair and professor of surgery Sandra Wong was announced as the president-elect of the Society of University Surgeons. Two top health care organizations have announced a merger that aims to more effectively meet the health service needs of the state’s residents. Dartmouth-Hitchcock Health and GraniteOne Health — which consists of Catholic Medical Center, Huggins Hospital and Monadnock Community Hospital — have just begun the lengthy process of combination. The spirit of the backdrop is ineluctable in “Tangerine” by Christine Mangan, and that is only the story’s locale. The story also undulates with its descriptive settings, passing between the snowy Green Mountains of New England and Morocco. 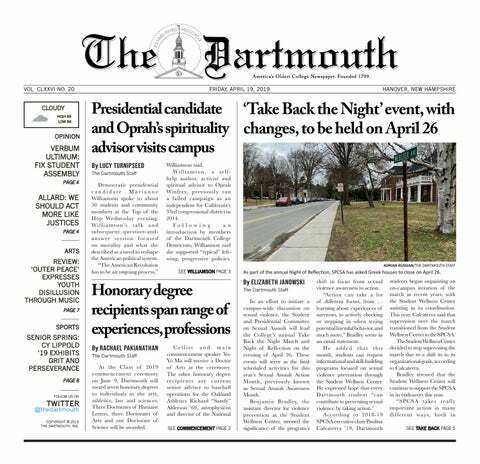 Dartmouth’s history is a complicated one, and making the official record reflect the experiences of all students is difficult.